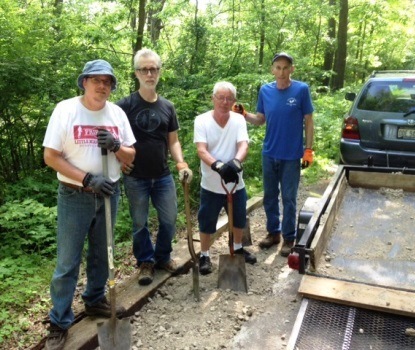 Two dangerous trail slumps were recently repaired by FLMSP volunteers contributing hours of heavy labor. The first, just south of Morrow, was caused by heavy rains pooling in drainage ditches because of a clogged culvert. The second, south of Fosters, has been a continuing problem and the cause is less certain. 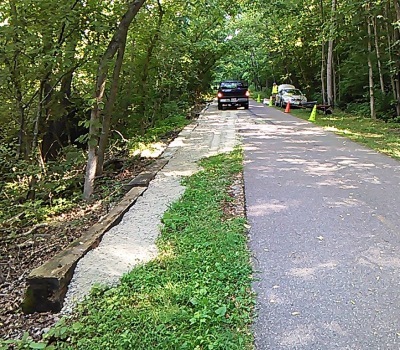 Slumping on our trail surface usually occurs as a result of drainage problems and riverbank erosion. Fixing the hazard requires more than just a patch—it takes shoring up the foundation, and sometimes more extensive stream stabilization work or culvert repairs. These repairs can be costly, and a permanent solution may need to wait awhile. In the meantime, the slumped or broken trail presents a real hazard to trail users. At both Morrow and Fosters, the work began by laying old bridge beams next to the slumped area to create a retaining wall (see top photo). 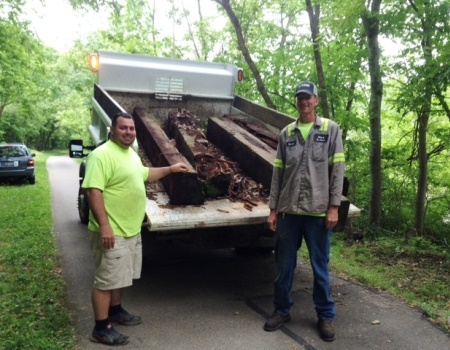 At Fosters, our volunteers appreciated the help from the South Lebanon Maintenance Department who delivered the heavy beams to the work site on the trail (left). Following beam placement (80 feet at Fosters), a contractor for the Ohio Department of Natural Resources delivered gravel to fill the slumps—tons and tons of it. At Fosters alone, it took 3 dump-truck loads, almost 30 tons, of crushed limestone to build up the eroded area. An ODNR employee and FLMSP volunteers spread the gravel. Now it will be allowed to settle before being covered with asphalt. All this work was accomplished over several weeks, with the sweat investment outweighing the financial investment. 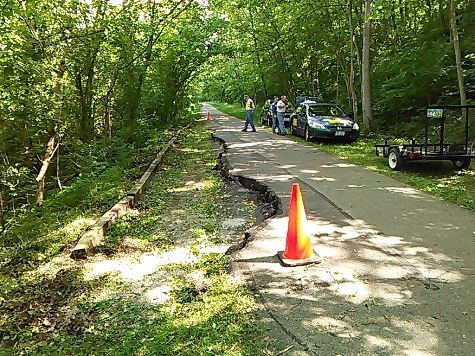 Thanks to Randy Taylor of ODNR, the South Lebanon Maintenance Department, and all the FLMSP volunteers who worked hard to repair these hazards.